Conservatives make a big deal about budget cuts when they try to portray themselves as fiscally responsible. 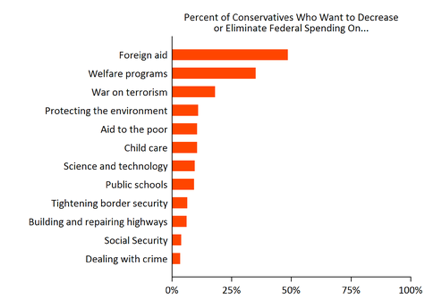 This chart tracks the spending cuts that self-identified conservatives want to see. Foreign aid makes up only about 1% of the annual federal budget. Cutting it to zero would do nothing for our budget deficit. I have no idea how conservatives define welfare programs, which 35% want to cut. However, only 10% want to cut aid to the poor and only about 5% want to cut social security. In 2008, safety net programs (excluding health care and social security) accounted for only 11% of the budget. And conservatives have been opposed to cuts in Medicare recently, which would generate substantial savings. The point to take away from this is that there is no consensus on cutting anything and the cuts many support would amount to very little. We know conservatives say they stand for smaller government, lower spending, and lower taxes. But the only idea they agree on is lower taxes, which in the absence of cuts in spending only lead to higher deficits. This is why budget deficits increased enormously under Reagan and Bush I and II. There is no coherent conservative philosophy here on the size of government or budget management. 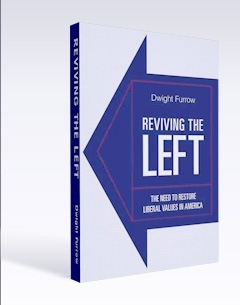 In the end, conservatism comes down to one idea—just cut my taxes. All the bleating about the size of government or “mortgaging our children’s future” is just so much blather.